Carrying 382 guests and 302 crew, Silver Shadow is large enough to offer multiple venues for dining, entertainment, bars and fitness, yet small enough to reach places that big ships can’t. Pictured here leaving the city center of Shanghai, China. Launched in 2000, Silver Shadow was the first of Silversea’s second-generation ships, following original vessels Silver Cloud and Silver Wind. Measuring in at 28,258 gross tons and carrying 382 guests, like her sister Silver Whisper, she’s small enough to offer an intimate cruise experience while also being large enough to provide a range of onboard experiences. 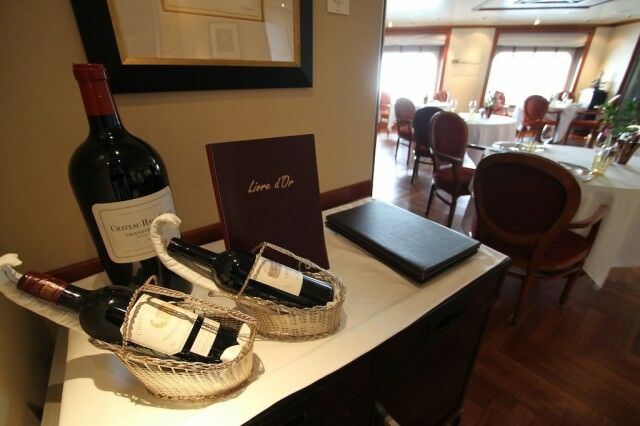 Guest Reception & Shore Concierge are situated on Deck 5. 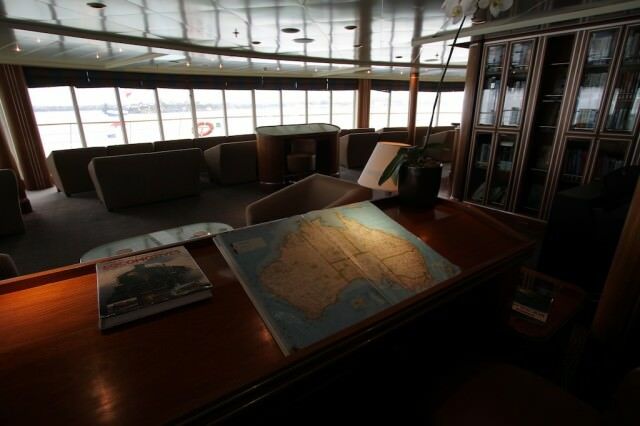 Like all the Silversea ships, Silver Shadow is designed with the vast majority of her public rooms located between midships and the stern, while staterooms and suites occupy the ship’s forward half. 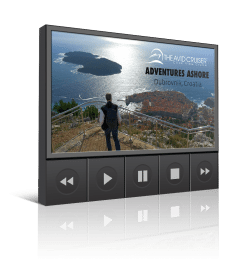 Want Help With Your Silversea Cruise? 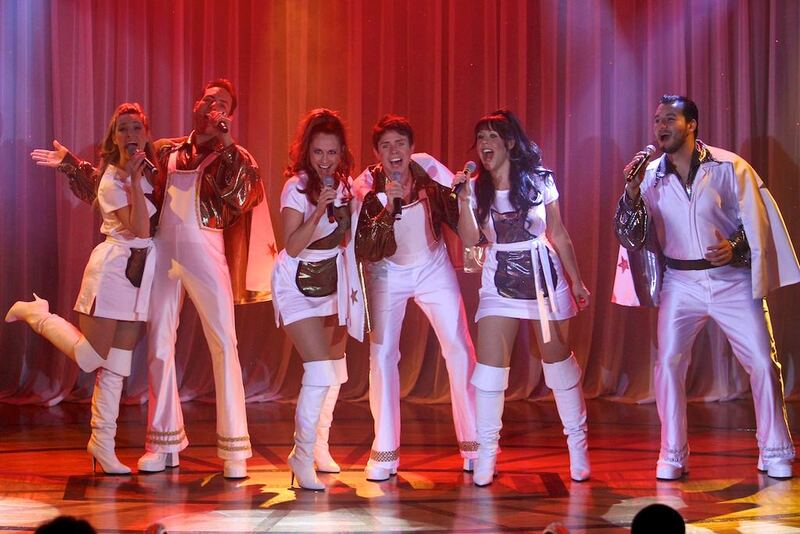 In October 2011, Silversea introduced a whole new entertainment concept, performed in the two-story show lounge. 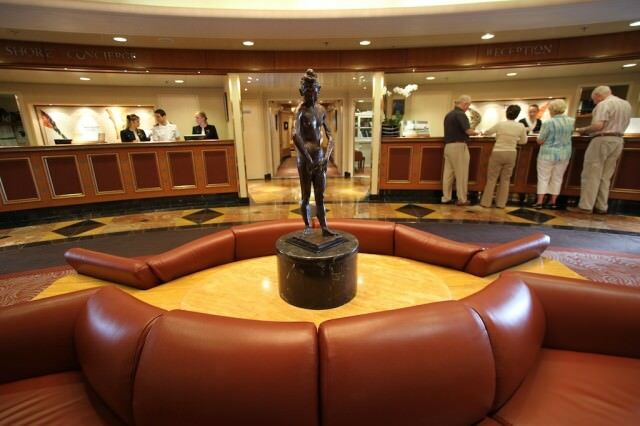 In the stern on Decks 5 and 6, the two-story show lounge has tiered seating and a profusion of cozy seating clusters. Just outside the show lounge on Deck 5, The Bar is a social hub where a band or DJ provides music for dancing. 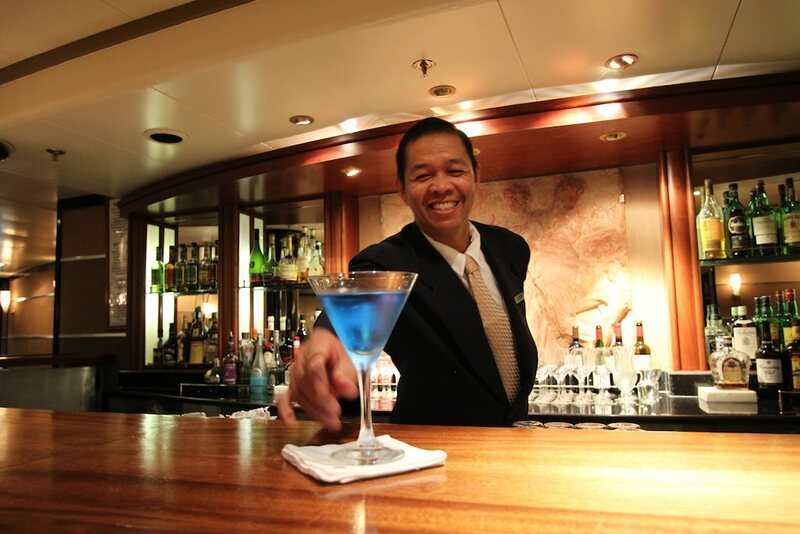 Friendliest bartender at sea? Carlito at The Bar on Deck 5. Farther forward on this deck is a small casino and the extremely cozy casino bar as well as the ship’s elegant boutiques. Two decks up, The Humidor is a dark, attractive room for cognac and cigars, with buttery leather armchairs. The Card Room, used for meetings and the card game Bridge (as opposed to the nautical Bridge), is on the same deck. 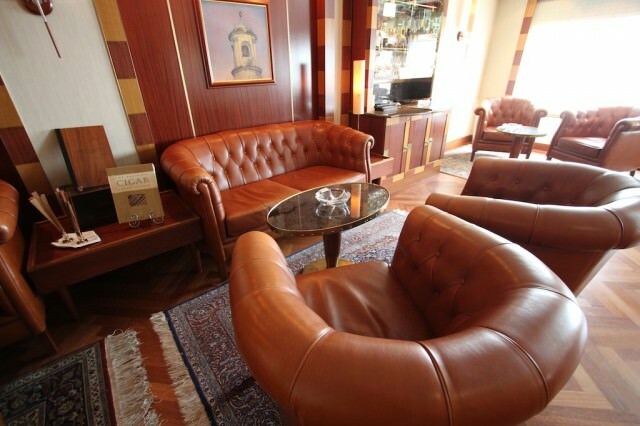 The buttery leather armchairs in The Humidor are just begging for a smoke. 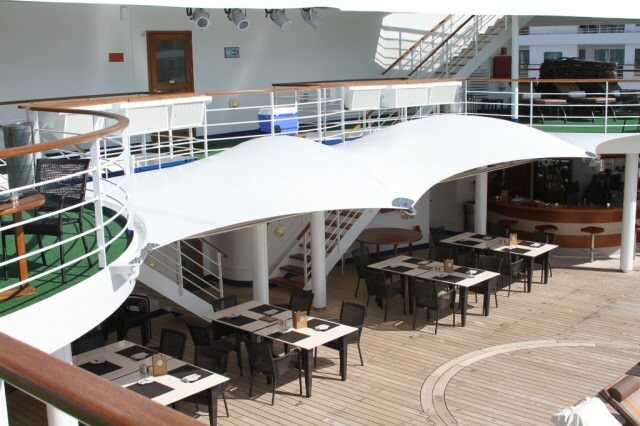 The Panorama Lounge, on Deck 8, serves a continental breakfast, afternoon tea, phenomenal sea views by day, afternoon activities such as trivia or dance instruction, and at night transforms into an intimate nightspot for dancing and piano music. Next door is an internet cafe with computer stations for guests who are not using their own devices through the shipwide WiFi (charges apply). Adjacent is a library stocked with books, up-to-date newspapers in several languages and a selection of more than 300 DVDs that can be checked out for in-stateroom viewing. The Observation Lounge On Deck 10. At the top of the ship, the Observation Lounge is a relaxed room, offering views forward over the bow as well as books (in addition to the Library on Deck 8), maps and binoculars for guests who like to keep track of their course. 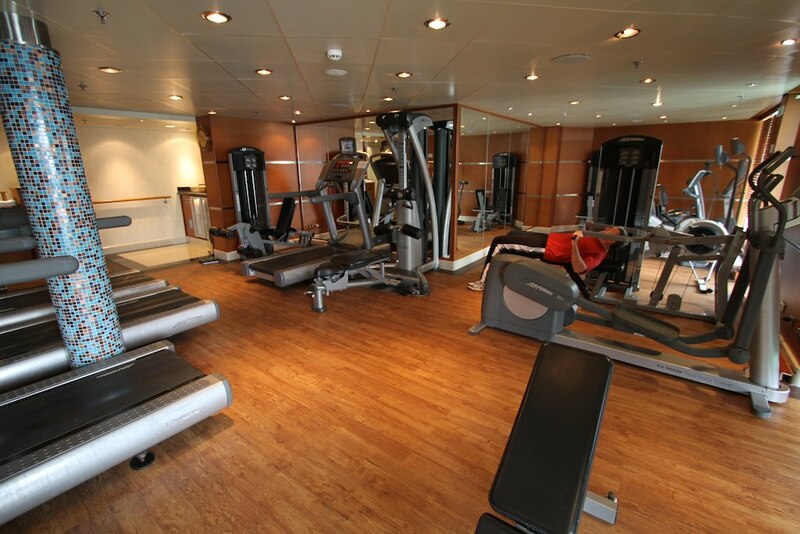 Behind the Observation Lounge, the Spa at Silversea is a fairly spacious facility offering treatment rooms, men’s and women’s saunas and steamrooms, a fitness center and a beauty salon. 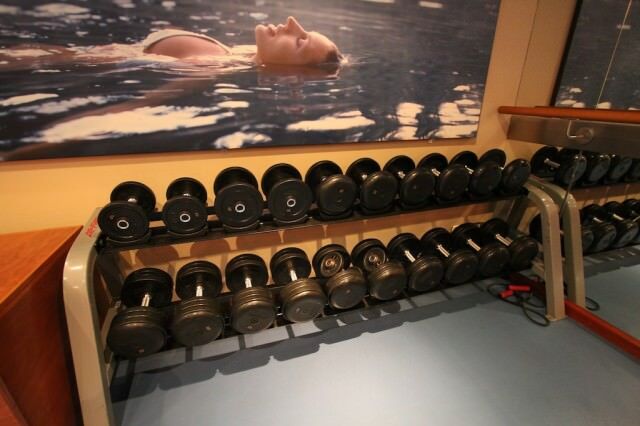 Dumbbells satisfy even the heaviest of lifters. The fitness room features a variety of cardio machines, bikes, treadmills and elliptical trainers, plus machines for weight-training. Outdoors, the resort-like Pool Deck is dotted with teak lounges, round wicker day-beds, and a pair of hot tubs, all arrayed around a pool that’s heated during cool-weather sailings. 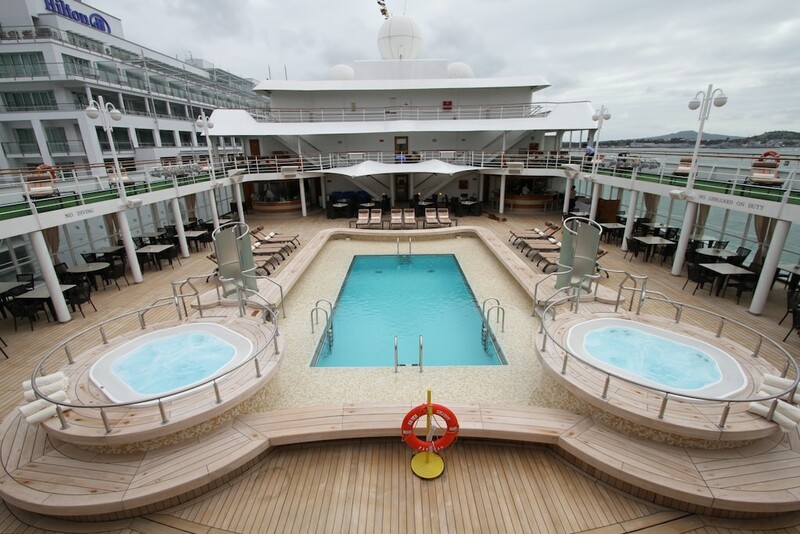 The Pool Deck, pictured on embarkation day (hence, no people), in overcast Auckland, New Zealand. Dining is one of Silver Shadow’s great highlights, with four restaurants from which to choose. The main restaurant, called simply The Restaurant, serves contemporary, international cuisine at breakfast, lunch, and dinner, with the latter featuring candlelight, dancing on some nights (and yes, guests do dance during dinner) and complementary (as well as complimentary) wines. 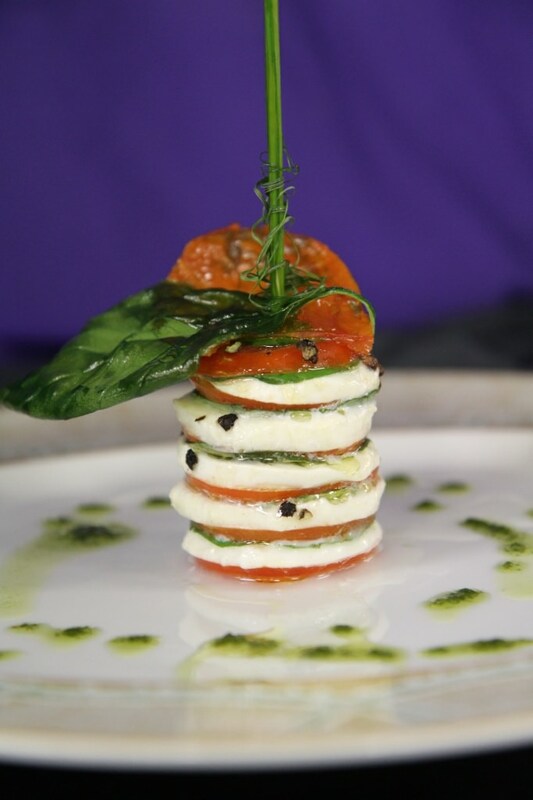 Wellness, vegetarian and “always available” selections are also available as are gluten-free products. 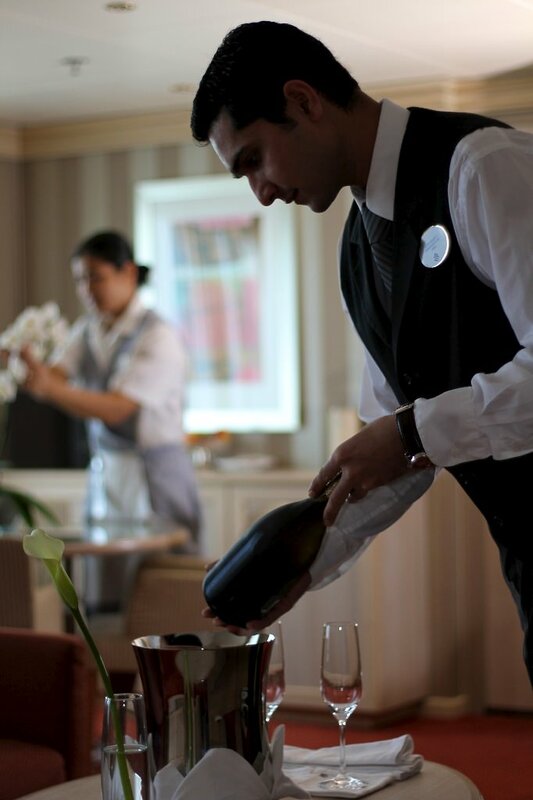 On Silversea, special dietary requests can be made before sailing, and those requiring special diets will have the opportunity to meet with the chef upon embarkation to discuss their regimens. Le Champagne, for memorable Relais & Chateaux experiences. For a more intimate (and extra-cost) meal, Shadow offers Le Champagne, created in partnership with Relais & Châteaux and serving six-course wine-pairing menus comprised of regionally inspired dishes. 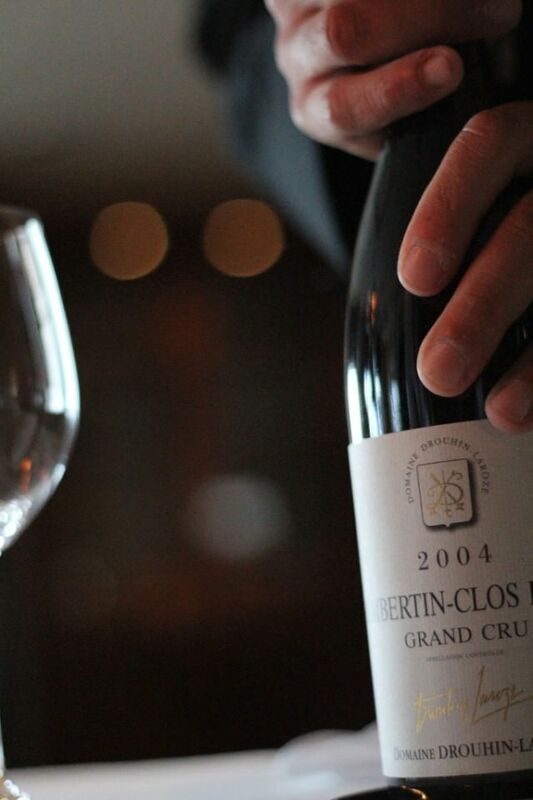 Wine pairings complement the gourmet Relais & Chateaux cuisine in Le Champagne. At the casual end, La Terrazza serves buffet-style breakfast and lunch with seating both indoors and out. 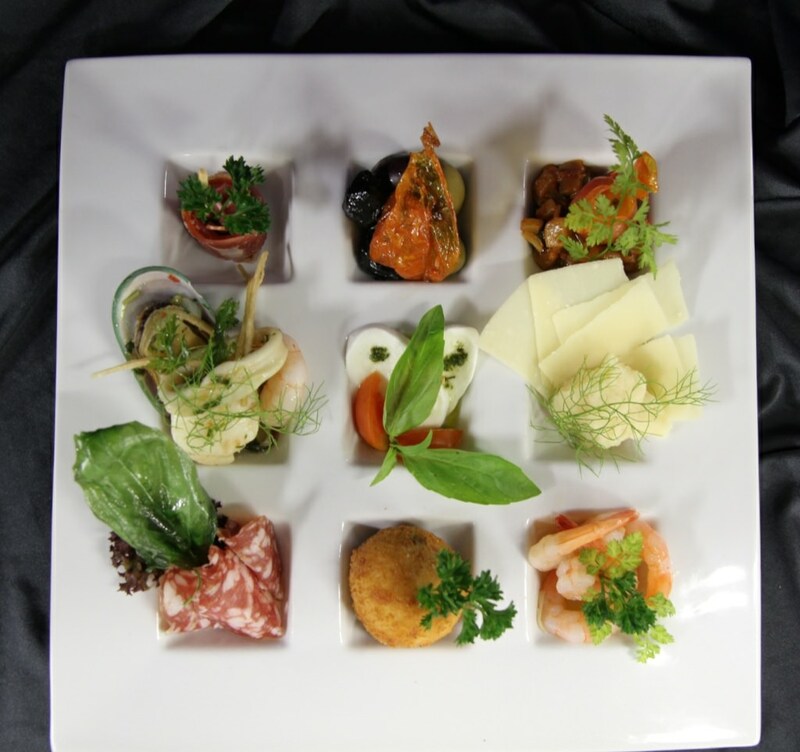 In the evening, it serves an Italian menu created on “slow food” principles — locally grown, sustainable, and fresh. Pasta and sauces are made fresh daily, using products from Italy. 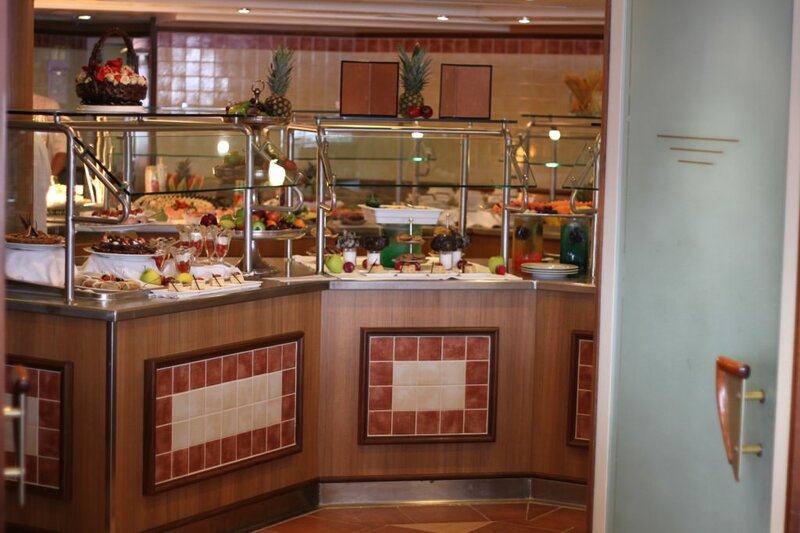 Breakfast and lunch in La Terrazza feature buffet-style dining. 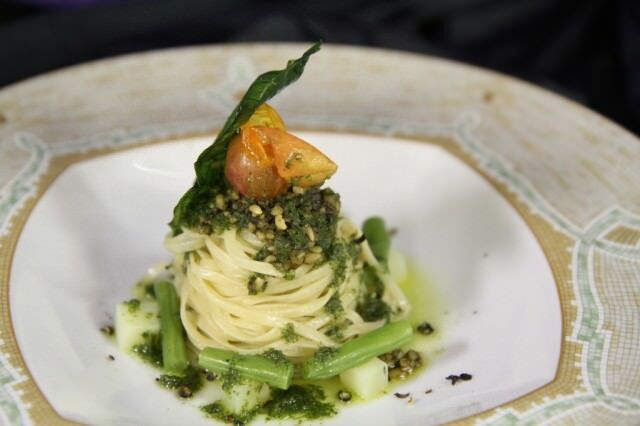 Dinners feature an Italian menu created on “slow food” principles — locally grown, sustainable, and fresh. 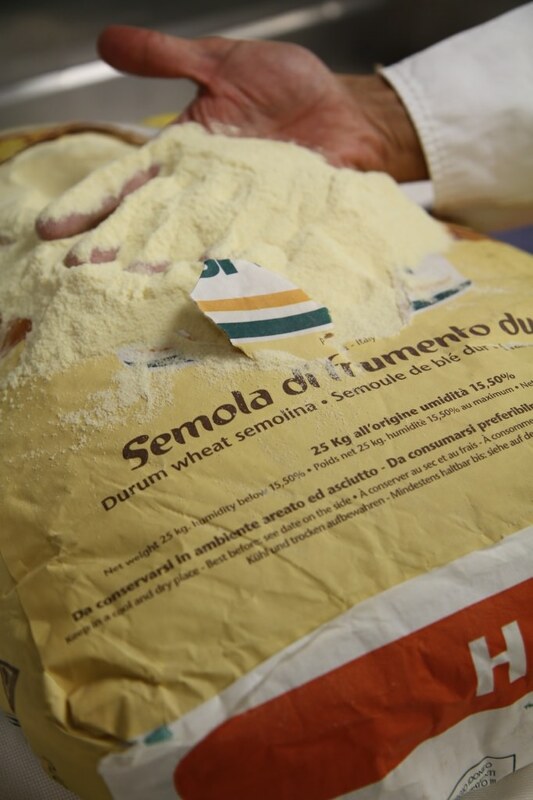 Pasta is made daily using the best products from Italy. 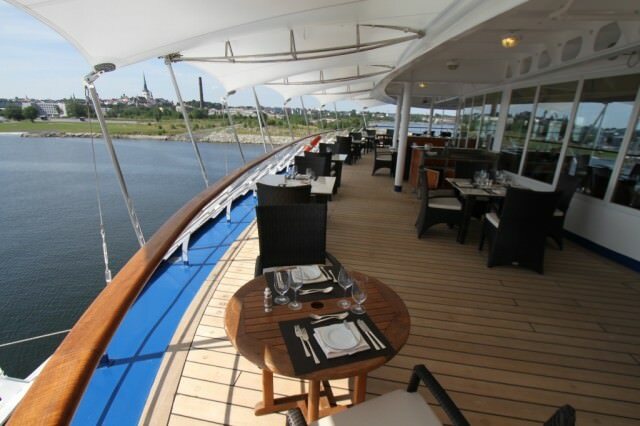 Dine indoors or outdoors at La Terrazza on Deck 7. The Pool Bar & Grill offers a Wellness Breakfast as well as casual lunches and dinners, the latter featuring the fun “Black Rock Dining” experience, in which guests can grill their own meat or seafood at their table on a preheated volcanic rock. The outdoor dining area is heated on cooler evenings. The Pool Grill dining area – open for breakfast, lunch and dinner. Evenings, Black Rock Dining is featured. Service is doting in all the restaurants, and if you’re not feeling social you can order lunch or dinner served course by course in your cabin, if you wish, from the day’s menu at the Restaurant. 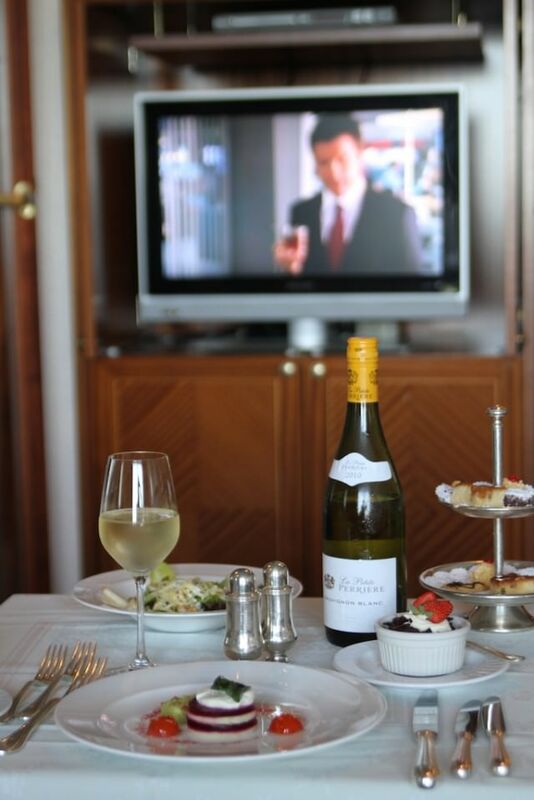 Stay in for dinner and order room service from The Restaurant, served course by course if you wish. The Owner’s Suite measures close to 1,000 square feet. Staterooms/suites range from the 287-square-foot Vista Suites (they’re all located on Deck 4) to the 919-square-foot Owners Suite and 941-square-foot to 1,090-square-foot Grand Suites, the latter two categories of which offer separate living rooms and bedrooms, large teak verandas, marble bathrooms with separate shower and whirlpool tub, and the option of booking and opening up an adjoining standard accommodation for even more space. 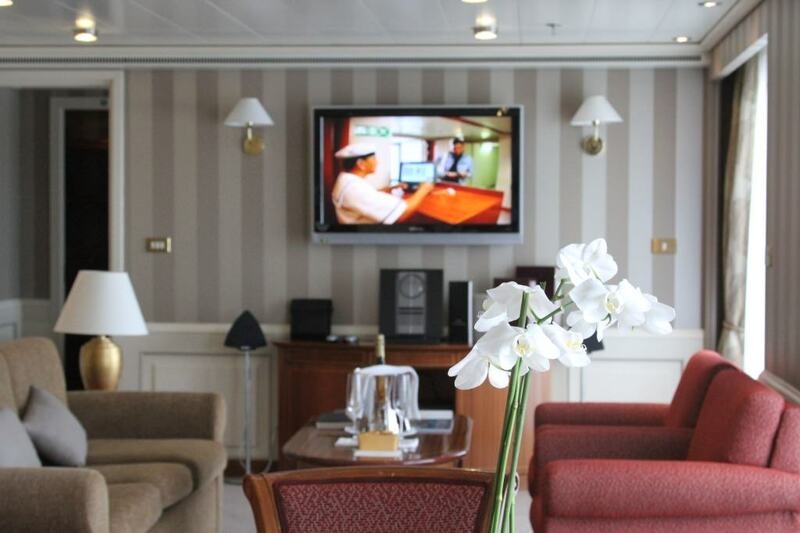 The Owner’s Suite: All the comforts of home — at sea. 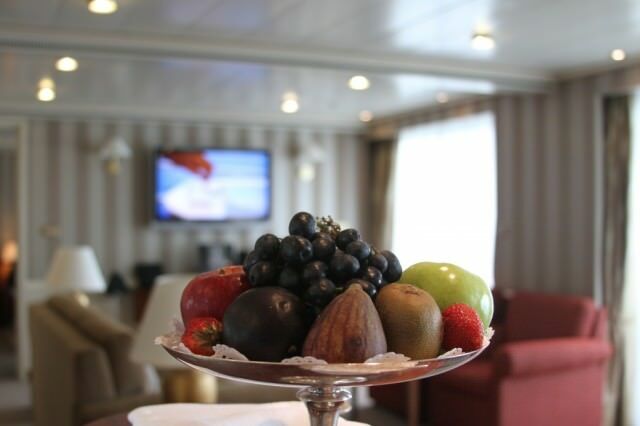 Fresh fruits are delivered daily to suites. Decks 6 and 7 forward features two Royal Suites, measuring 990 square feet, with verandas measuring 129 square feet, and the option to book an adjoining stateroom for 1,366 square feet of living space, plus an additional veranda. Measuring up to 701 square feet, Silver Suites, situated on deck seven, are a popular category for location, comfort and value. Deck 7 features 13 Silver Suites, measuring 653 square feet to 701 square feet, including the verandas measuring 110 square feet to 123 square feet. 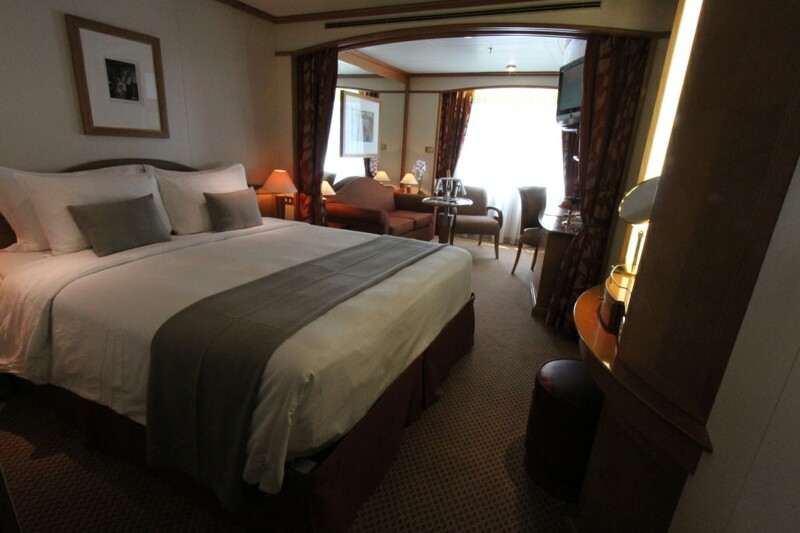 Silver Suites are the Avid Cruiser’s favorite category for comfort, location and value. 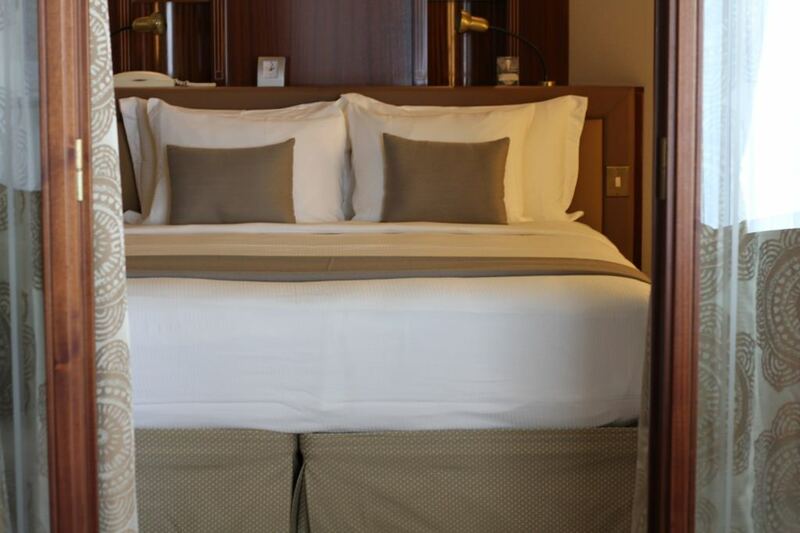 The Silver Suite bedroom can be closed off from the living area. The two Medallion Suites on Deck 7 measure 521 square feet, with teak verandas. The vast majority of accommodations aboard are 345-square-foot Veranda Suites, with private teak verandas, marble bathrooms, and walk-in wardrobes. 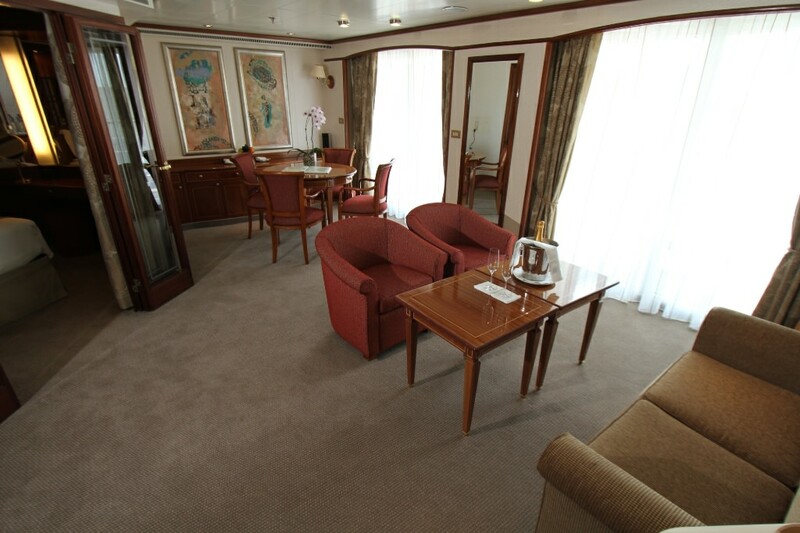 Veranda Suites are the most common types of suites on the ship. 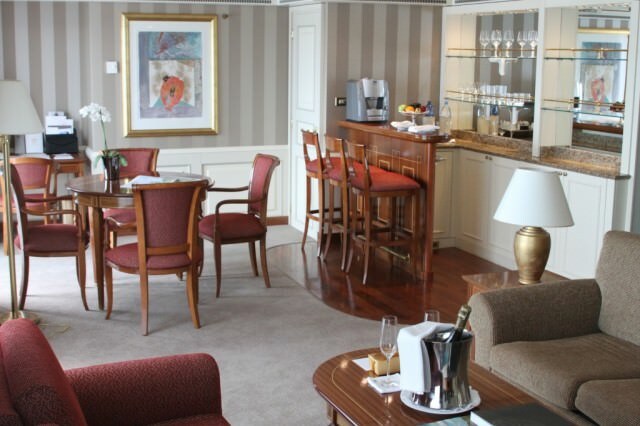 Silversea features butlers for all staterooms and suites. 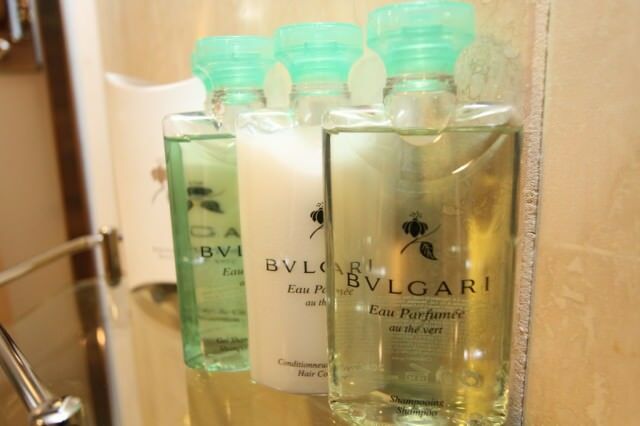 All accommodations on board come with butler service, a bar setup stocked with your preferences, wifi access, European bath amenities, fine linens and down duvets, a choice of nine types of pillows, and a choice of aromatherapy fragrances created by Italian perfumer Laura Tonatto. Your selection of European bath amenities includes Bvlgari products. 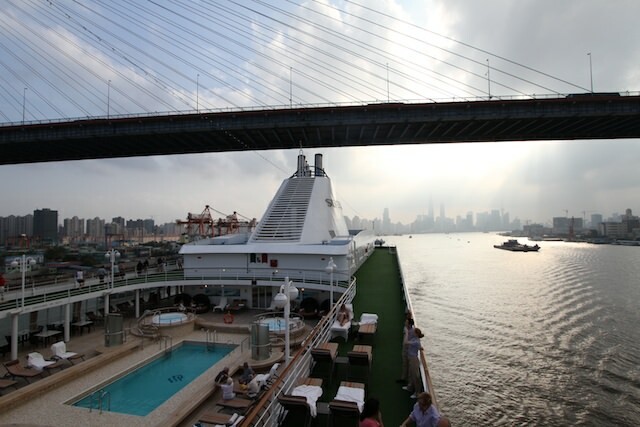 As with all of the vessels in Silversea’s fleet, Silver Shadow delivers a luxury cruise experience that would be hard to beat. 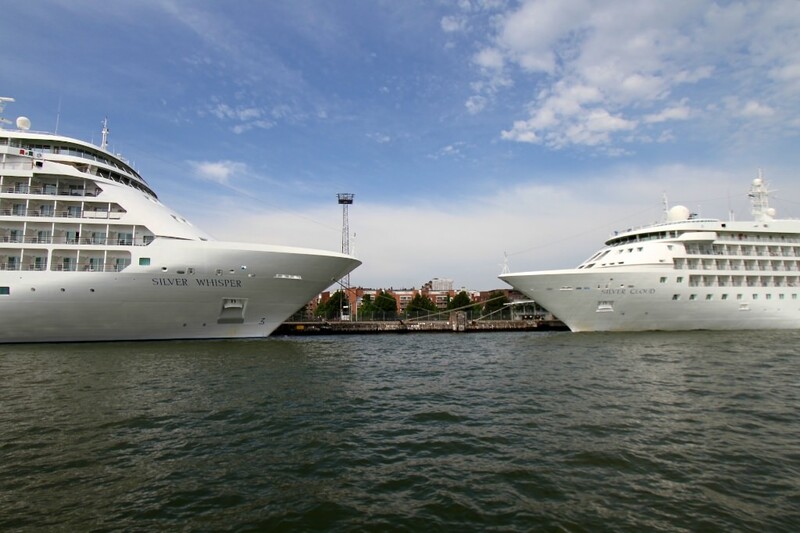 Where Silver Shadow stands apart in the Silversea family is its size. For those who find Silver Cloud and Silver Wind too small, and Silver Spirit too large, Silver Shadow and its sister, Silver Whisper, are like the glass slipper that the charming prince slipped on Cinderella, a perfect fit. Top 10 Highlights From Silversea Voyage 3403: Should You Cruise Indonesia? My Perspective: Silver Shadow, Ship Shape? 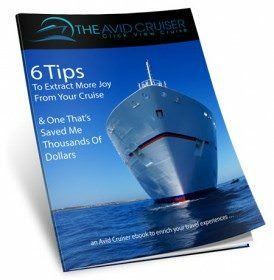 First-Time Cruisers: Over-Stimulated At Sea?